There is no denying that the UKFast Campus is an absolute mad house. I’m talking like 90s TV show Fun House-style, without the gunge. But there’s a method to the madness and, as our CEO Lawrence explains in the following video, creating an unbelievable work environment and making the team feel at home is incredibly motivating. The BBC recently popped over to take a look at the office – here’s what they found. 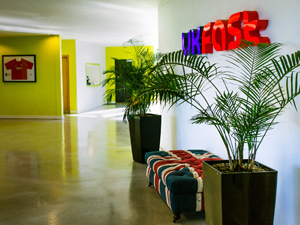 There aren’t many places that would see the value in having a pond, bar, gym, pool and ping pong tables (not at the same time), PlayStation and auditorium at work – to name just a few things – but our CEO Lawrence has invested time, money and energy into making the UKFast Campus an office like no other! BBC Breakfast recently asked to feature us in their amazing offices programme; they popped by to take a look at some of our amazing facilities and meet the team. Have a sneaky peek at our amazing office and hear why Lawrence thinks it’s so important to provide a working environment that really goes above and beyond! You can come and visit the UKFast Campus, meet the team, have a drink at the bar and network with like-minded people at one of our UKFast events.